I baked my first loaf tonight. This recipe is nothing if not idiot proof. I got mixed up & did the slashing thing at the beginning of the resting/raising period instead of just before it went into the oven, but I don't think it made much of a difference. I spilled about half the water trying to pour it into the pan on the bottom shelf then, like the aforementioned idiot, opened the door to add some more. The blast of steam just about melted my head. I was feeling a lot more like Lucy Ricardo than Julia Child. The bread is wonderful. The crust is especially delicious. I am delighted & amazed. I can't wait until I get the book. I make something like this. 70% hydration stays in the refrigerator for weeks. I combine yeast and sourdough starter. I bake it inside a terracotta pot 30min covered 10 uncovered. It's my daily bread. I spilled about half the water trying to pour it into the pan on the bottom shelf then, like the aforementioned idiot, opened the door to add some more. The blast of steam just about melted my head. I was feeling a lot more like Lucy Ricardo than Julia Child. Try this next time. Instead of pouring water into the pan, toss in a good handful of ice cubes. I gave up on the water thing after a few incidents like yours. The ice cubes seem to work much better. I don't try for a second steaming as this initial one seems to give me a great crust. What a beautiful loaf. Bravo. Gorgeous bread. Did you use all white flour? Yes, it was all white flour. I had intended to use 1 cup of whole wheat, but completely forgot when I mixed up the dough. Next time it will go in. Oh, the ice cube idea is brilliant. Thank you! By the way, this makes great toast. John, that sounds incredible. I wish you lived next door. I don't slash and I use about 1/4th the yeast that the recipe uses. This has do do with why Ice Cubes **appear** to be a good idea. But aren't. You only *see* steam, when it *cools*. And condenses to a fog of water droplets. With ice you have *lots* of cooling. Therefore some visible condensation to cold fog. Many people (even unscientific bakers) think that the steam from a pan (or even a spray) disappears quickly and so "must" have been vented away somewhere. Actually it just disappears because it has turned into *hot* (and so invisible) vapour. And even when you don't see it, its there, and working hard for you. Notice that, once its boiling furiously, the steam only becomes visible an inch or so outside the spout. After its been cooled down by the air. For bread baking, you want the hot, invisible stuff, just like in that first inch. What you should be aiming for, is hitting the dough with *exactly* the blast that you experienced, when you reopened the oven door. The damp air transfers heat much more quickly than the normal dry air you usually meet when you open the oven door. Fast initial heat transfer is what you are after for well-risen bread. And some dampness. If you want it condensing anywhere, its on the dough... NOT around some really cold ice, chilling the oven. The dough should be the coldest thing in the oven! Pull out the bottom shelf a few inches, so you can more easily target the hot pan with the boiling water. You don't need much, or for long. And it doesn't need to be visible! Don't go for the visible, but cold, fog from ice cubes. The oven environment is supposed to be *hot*, isn't it? If you want it condensing anywhere, its on the dough... NOT around some really cold ice, chilling the oven. Scientific or not - it works for me! The oven is extremely hot at this point and the ice "boils" almost instantly when it hits an already very hot surface. I get lovely "crackly" crusts this way. Thanks for this info. I started some of the 5 minute bread (my first batch) this morning. Do I understand you correctly that I should pour boiling water into the roasting pan on the lowest rack in my oven? Then bake the bread on a stone on a rack immediately above? How much water should I use? I really must get this book - unfortunately, it is sold out at my local bookstores and out of stock at Amazon. ... Do I understand you correctly that I should pour boiling water into the roasting pan on the lowest rack in my oven? Then bake the bread on a stone on a rack immediately above? How much water should I use? Boiling water into a hot pan is the best way I know of to get plenty of hot water vapour into the oven air, in a domestic electric oven. About a cupful is all that's needed. About 1/3 of the way through the bake, (so after its fully risen and 'set'), I remove the pan, whether or not it has boiled dry. Opening the oven to take it out allows a lot of the moisture to escape -- the crust wants much lower humidity for the last half of the bake, so that's good too. 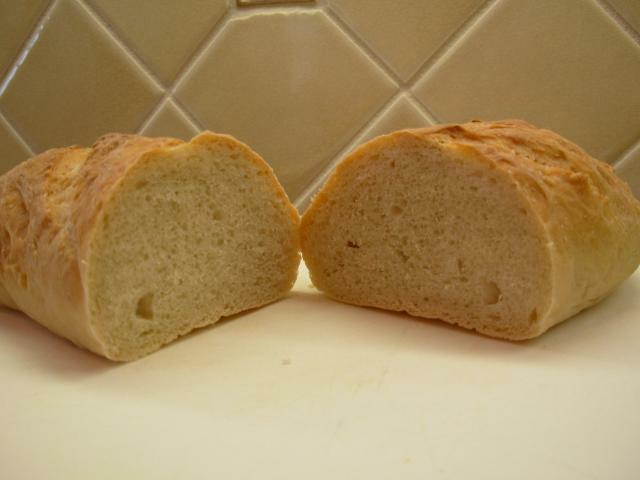 The loaf only needs steam for its first two minutes in the oven, or so says Harold McGee and Peter Reinhart. 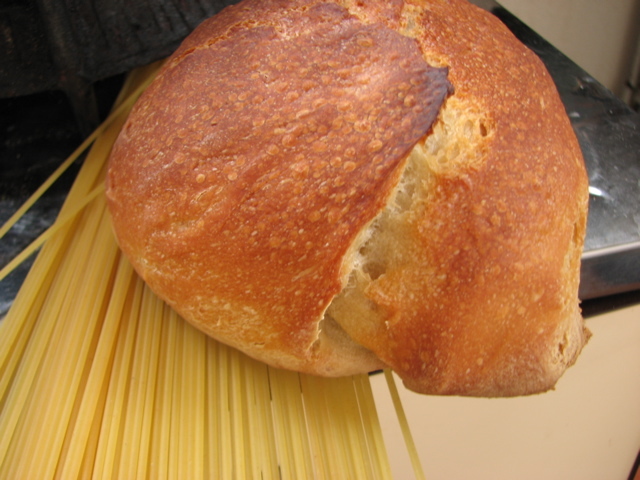 In my own experience, I've noticed that the crust gets chewy rather than crackly if left in too long. 12 minutes, assuming a 35-40 minute bake, has been too long in my experience. Try to steam the bread for 2 minutes. I like to boil a pan of water in a stainless pan, put it into the oven (550 or higher) and leave it in there for 2 minutes. Then I take it out and reduce the heat to 450. I don't know what he says about steam, but I'd hestitate to accept his contradiction of specialists. Reinhart on page 92 of BBA, says that steam is valuable "only during the first half of the baking process". Its possible that you may be confused by commercial oven practice with a steam lever -- giving a blast of steam on demand. You will see various bits of advice about not using that lever to admit more fresh steam after the first couple of minutes of baking. Hamelman says "The benefits of steam occur only during the first third or so of the baking cycle. If the baker neglects to inject steam at the time of bread loading, he or she cannot compensate by steaming the oven several minutes later. In order to ensure that the crust remains thin and crisp, it is important to finish the bake in a dry oven. For this reason, the oven should be vented or the doors notched partially open for the last portion of the bake." - (Page 27). On page 192, Hamelman makes clear that these commercial ovens should have their vents opened (to release the damp air) "once the bread has begun to colour, usually after about 15 minutes of baking." Dan Lepard on page 22 of The Handmade Loaf says "For the first 10 minutes of baking, the loaf needs to expand to its fullest extent ... A moist environment enables this to happen." About 1/3 of the way through the bake, (so after its fully risen and 'set'), I remove the pan, whether or not it has boiled dry. Opening the oven to take it out allows a lot of the moisture to escape -- the crust wants much lower humidity for the last half of the bake, so that's good too. I actually thought that was pretty mainstream advice from the experts. "Steam does several useful things during the first few minutes of baking." He mentions increasing the rate of heat transfer, prevention of a premature crust that would interfere with rising and gelating the starch to form an attractively glossy coat. "In home ovens, spraying water or throwing ice cubes into the hot chamber can produce enough steam to improve the oven spring and crust gloss." "Oven spring is usually over after 6-8 minutes of baking." So I guess even the experts disagree. Remember the domestic "steam breadmaker" ? The benefits of steam occur only during the first third or so of the baking cycle. If the baker neglects to inject steam at the time of bread loading, hecannot compensate by steaming the oven several minutes later. In order to ensure that the crust remains thin and crisp, it is important to finish the bake in a dry oven. For this reason, the oven should be vented or the doors notched partially open for the last portion of the bake. Jeffrey Hamelman is Director of the Bakery and Baking Education Center at King Arthur Flour Company. This explains why the quote you have given matches, word for word, the one I gave up-thread! Incidentally, looking through Reinhart's BBA, I noticed that he speaks of using a (measured) cup of boiling water into a large pan -- but I've not spotted **any** instruction whatsoever to remove the pan during baking! I'm sure that a pan as large as is illustrated will boil dry during the first half of the bake, but I'm all the more surprised by Saucée's 2 minute removal, citing "Harold McGee and Peter Reinhart". * Incidentally, I think Hamelman's book, though under-hyped, is rather special, being written primarily for the working professional manual baker, while being carefully kept accessible (and thus very useful) to the serious amateur. There is sure to be disagreement among experts as among non-experts. You should follow the method that has worked for you. I was commenting according to my own experience, having tried steaming for different lengths of time. Its [steam's] value is only realized during the first half of the baking process. 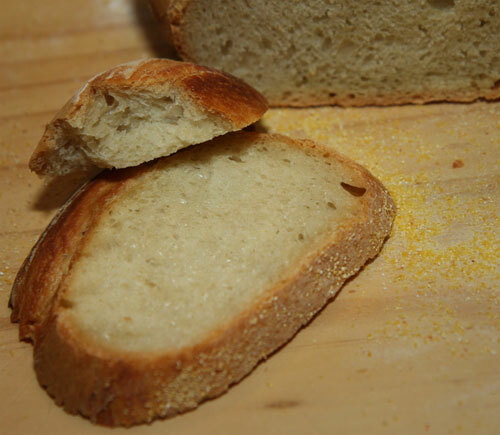 After that the bread needs a dry environment in which to develop its crisp crust properly. 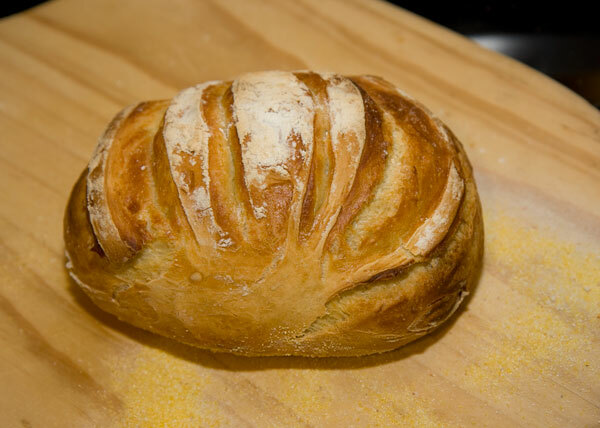 For this reason, all of the steam is generated during the first few seconds of the bake, with its lingering effects fading out as the bread continues to bake. There is no advantage to steaming late in the process, nor even after the first few minutes, once the crust is set. The method he advocates on pp.93-94 is using a cast iron pan, preheated with the oven, to which hot water is added before the bread goes into the oven. He then sprays the walls of the oven in 30 second intervals for three sprays: "I usually do three sprays at 30-second intervals to replicate as closely as possible the steam of a bakery oven." Note that he also says "there is no advantage to steaming late in the process, nor even after the first few minutes, once the crust is set." I am not confused about how a bakery oven works nor have I misread the sources that I've used to learn about baking, as your email seems to suggest. If I use a pan with boiling water and spray three times for steam in 2 minutes, I am getting about 5 or more minutes of steam since it is trapped in the oven. According to what I understand about bread baking (I don't claim to be an expert) and my experience, this is enough to produce a crackly crust. Whenever I have steamed longer, the crust has been too soft and chewy. I might point out that none of your quotations give precise directions for how to get maximum ovenspring. Lepard says there ought to be a moist environment to produce maximum spring but I don't see where it follows that he is advocating the heavy use of steam for 10 minutes. That's overkill in my experience. To produce a moist environment, you can steam for a short amount of time, then trap the steam in the oven. 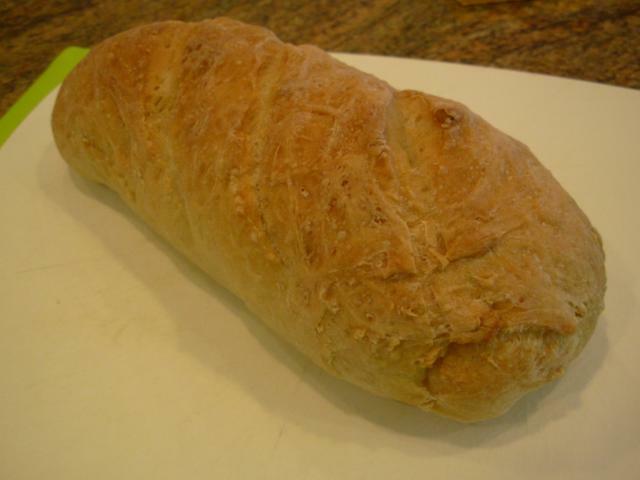 This provides just enough steam to provide spring and a good crust while not compromising the loaf's crust to chewiness. I must say that my first experience was, well, disappointing. Yesterday morning, I made the master recipe as directed, however, I did not realize until too late that I used "rapid rise" yeast rather than regular yeast. So I made a second batch using regular yeast. Last night I cooked two loaves from the "rapid rise" batch, thinking that I should use that dough asap. I did add approximately 3/4 cup of boiling water to a pan on the bottom rack of my oven, and I cooked the loaves on a stone (preheated) on the middle rack. I let the loaves rise for 40 min., as directed, but they did not seem to rise well, so I gave them another 15 minutes and then baked at 450F for 20 minutes (as they were small loaves). Here is the result. The crust was OK, but I did not care for the texture (obviously the rise was insufficient) and it didn't have much flavor, at all. Tonight, I will bake a couple of loaves from the other batch - hopefully the "rapid rise" yeast is to blame for these poor results. I think the directions are misleading as reprinted many times - the 40 minute rise is for freshly made, unrefrigerated dough. I believe that the correct direction should be to add 60 minutes to the rising time for refrigerated dough. If anyone has the book and can confirm this, it would be much appreciated! non-refrigerated dough rests for 40 minutes on the peel. refrigerated dough rests for 1 hour on the peel. These times are for dough that is using less yeast. If you are following the recipe in the book, then just stick to those instructions. You need to allow the dough to warm up somewhat before baking or your dough will be too dense and you will also have uneven oven spring. So if I'm understanding her correctly, using the standard "master" recipe, the rise time should be 40 minutes even for refrigerated dough. I hope someone with the book chimes in, because now I am really confused. I have the book and I think it is a little confusing there also. They go into detail over the master recipe and say to let it rise for 40 minutes. Later on, they say to refrigerate the remainder. So they never really discuss the rise for the refrigerated dough for the master recipe. However, after I started trying some of the other recipes, I saw that an hour should be added to the rise if the dough was refrigerated first. I then starting letting the basic recipe rise for 1 hr 40 minutes and have had much better results. Thanks! It was just instinct with me since there is no rise whatever after 40 mins when the dough is at 35F! But I wanted to be sure that I wasn't just extrapolating from the usual way of working with dough. I think, too, that one has to factor into this extra hour the ambient heat of the work area. So it might be longer in a cooler environment or shorter in a warmer one. I think it also important to realize that they don't advocate any punch down but shape the boule causing as little deflation as possible. This is much more evident in the video than in any reprint of the recipe. I also was confused about the time. I thought she meant to add an extra hour when the dough was refrigerated, so I let it rise for 1 hour & 40 minutes. That worked for me. By the way, I sawed off a handful & made a pizza last night. It was better than anything we can get locally. Pizza dough on demand... a dream come true. That's my favorite thing of all. We haven't gone a week without pizza and stromboli since I first started making the dough. My go to before that for a quick dinner was Boboli pizza crust but I will never need to resort to that again!